Happy Monday, friends! While you are reading this post, I am on a plane to Las Vegas for the SDE Differentiated Instruction conference and the first ever Teachers Pay Teachers conferences. I.CANNOT.WAIT. It is going to be an amazing week of learning and meeting some of my favorite cyber friends. 🙂 While away, you can keep up with me and the conferences on Facebook, as well as, Instagram! I’ll be back on Thursday for our Reading in the Wild book study, and then, over the weekend I’ll share about my amazing week! 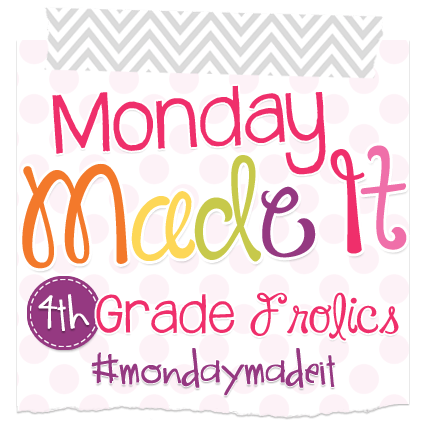 Today I’m joining the spectacular Tara at 4th Grade Frolics for Monday Made It! With a new city and new school, I’m designing/creating my classroom from the ground up. Plus, I’m now teaching in a BRAND new school (it’s only been open 2 years), so everything is beautiful. I have 4 REAL walls (rather than partitions) and my walls are tan and blue, not bright yellow. It’s amazing! One of my first projects of the summer took place yesterday – my word wall. 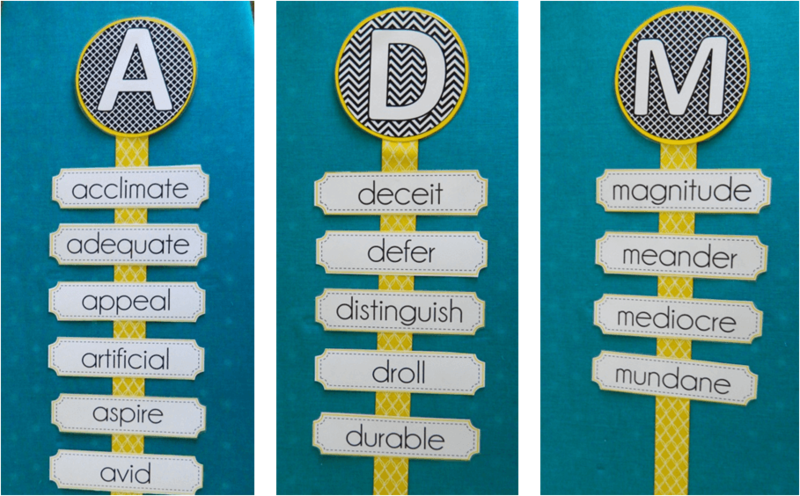 Initially, I planned on using a word wall different from last year…just to change it up, kicks and giggles – I say. Well friends, why change something that works?? 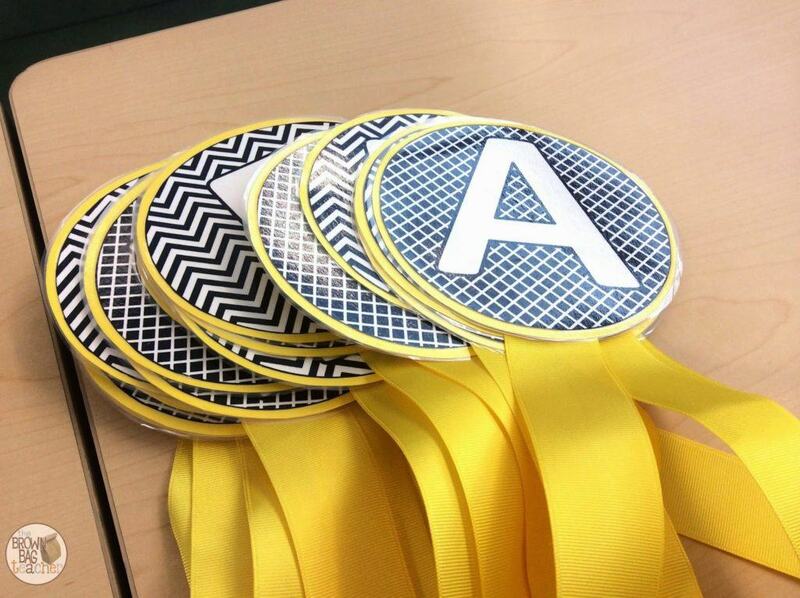 Plus, last summer I spent an entire Sunday afternoon cutting out yellow circles and pieces of ribbon. (I choose to add yellow circles and ribbon, but you could change it out for any color/texture/style to match your room.) All of the pieces were still in great shape, so I decided to stay the course and use the interactive word wall! 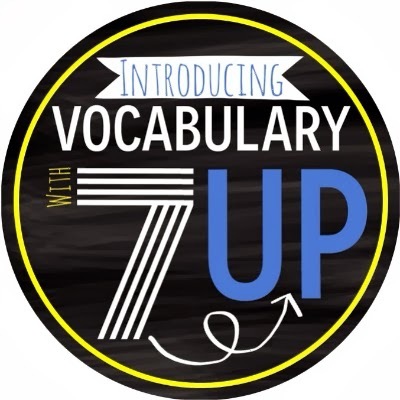 Vocabulary is a HUGE part of the Common Core and plays a huge role in reading comprehension, so I really wanted my students engaging with and grappling with new vocabulary on a daily and weekly basis. With that said, I really wanted to do it in an authentic way…I didn’t want to throw a list of words at my 5th graders. 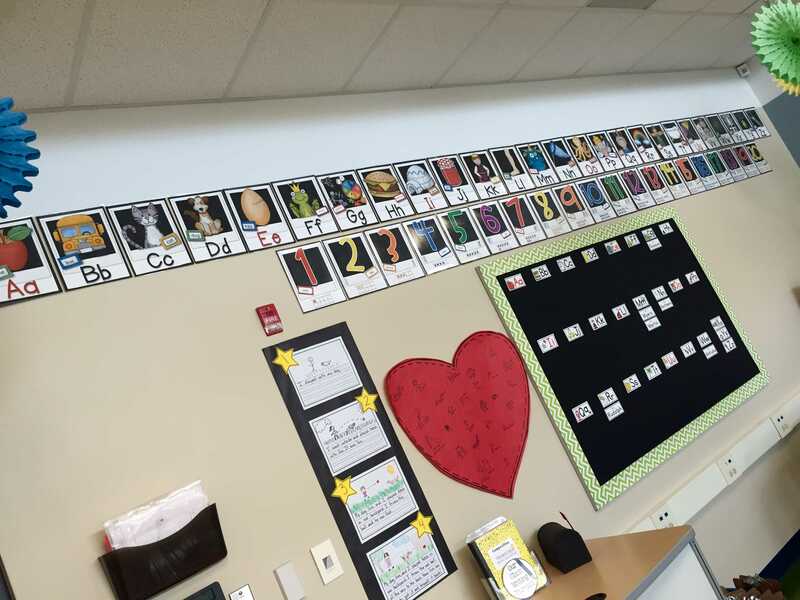 So, I designed this interactive word wall where students learned 15 new words each week – 10 words from our Flocabulary video (Read about how we use Flocabulary here.) and 5 ‘Student Choice’ words.Throughout the school year, my students submited vocabulary suggestions from their own reading, using this quick and easy form. From these requests, I picked 5 words each week to include on the wall. The first few weeks of school, I picked all of the words as I ‘trained’ students to use this system. On Mondays, we watched the Flocabulary rap video, introduced the words, and recorded the words in our vocabulary logs. Vocabulary was our mini-lessons on Mondays, and then, we spent 5 minutes (or less) practicing/using the words throughout the week. On Tuesdays, we used the words in 7-Up sentences with our shoulder/fact partners. On Wednesdays, we found synonyms and antonyms for our words, and on Thursdays, we played a quick game of Showdown. Finally on Fridays, we assessed! 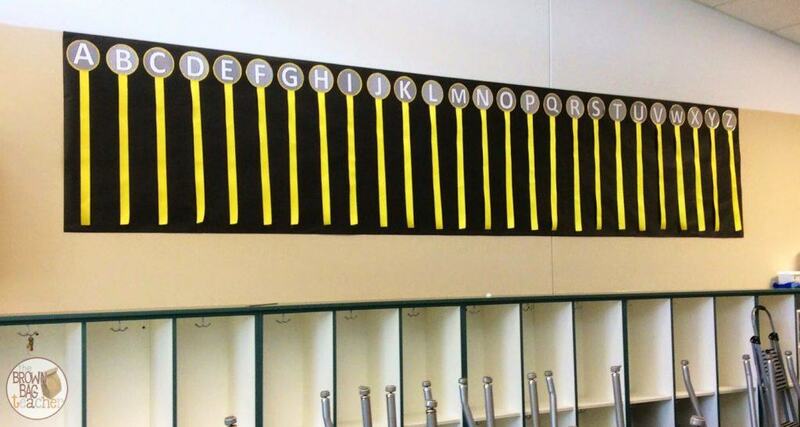 Since I had already assembled the letter headers making the word wall this year was simple. 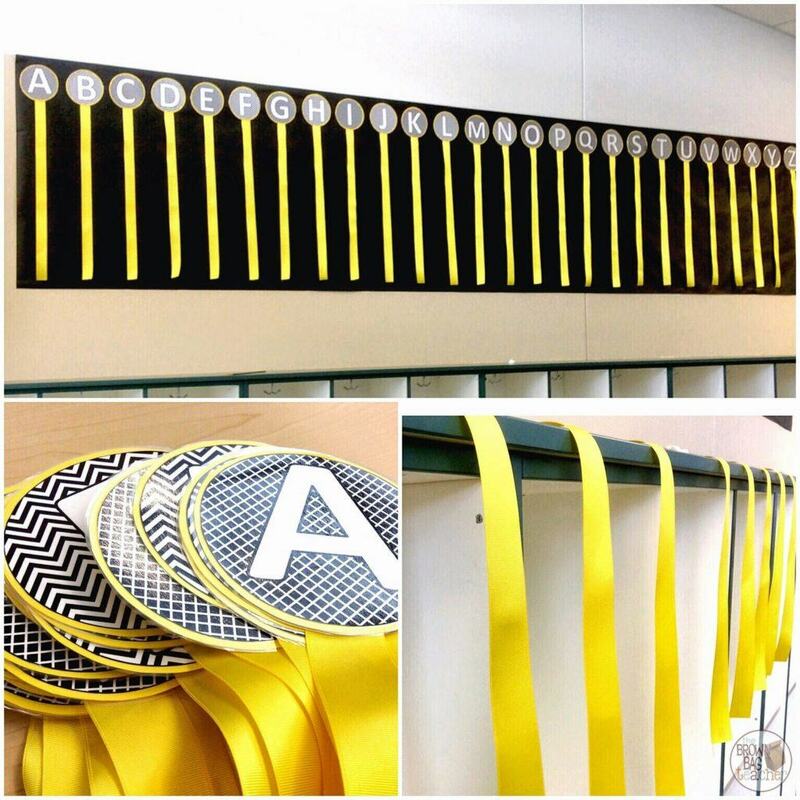 To make the headers, I used a circle cutter to cut the yellow circle backgrounds and then, the circle-letter headers. I attached 2 feet of ribbon to the back of each header. Working together, Mom and I were able to put up the word wall is record time – 50 minutes!! I used 13 feet of black bulletin board paper to act as a background for the headers and then, attached the headers/ribbon use masking tape. SIMPLE! How do you manage your word wall? 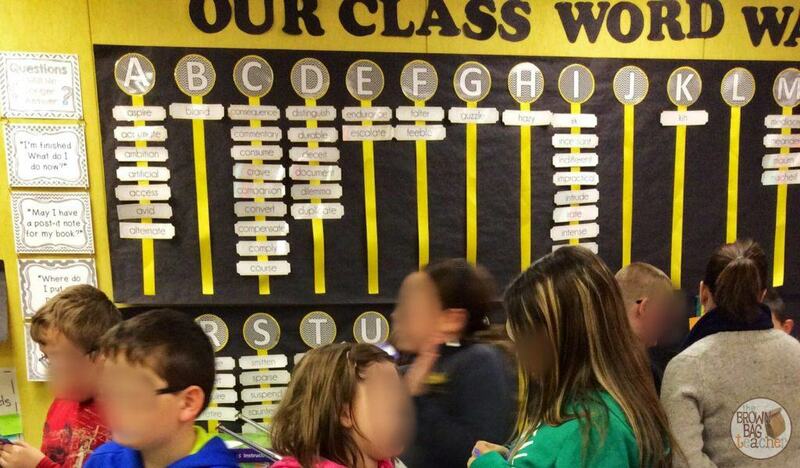 Do you include student-choice words or use a school program? I would love to hear what is typical at your school. 🙂 Also, make sure to stop by Monday Made It to check out all of the amazing summer projects out there! I really like this idea! We will have to wait and see what my room looks like but this might be an awesome choice! It looks great! I recently helped my daughter put up her word wall. It looks very similar to yours! We used gray fabric on the background and chevron border. Her letters are a lot like yours, but with a touch of green and she used green ribbon. I'm looking for ideas for my own board now! Thanks for sharing! Those are very attractive, I really wish I had more wall space to do something like this. I love that you use a word wall even in the older grade! It is really cute too! Love this! Cannot wait to see your classroom reveal! Thank you, Sarah!! And I have many more hours left before I can show it off-ha! 😉 Sitting in the airport now!! Just added those headers to my wish list! I'm loving that word wall! Last year I put my letters on my white board, so we could write words on our word wall whenever new words came up. I'm getting a new classroom and I think it has limited white board space, so this is a great alternative! I love this and wish I had more wall space! I love the idea of a building list for your students, it makes it that much more engaging! I LOVE your word wall! I am sort of doing something like this for my homophones. TOO CUTE! Wow! Your word wall is gorgeous!! I love it!!! IT IS PERFECT!!! This is a post chock full of great info. I'm really interested in the way you teach vocabulary. Could you explain a bit more how you assess on Friday? Also, when I clicked on the link for "showdown", I didn't find an explanation of that page…am I missing it? I'm going to ask PTO to get Flocabulary for my team and try to use some of your ideas. Thanks for a great post! I love the ribbon on your word wall! I wish I had the space to do that. Love your word wall, it's gorgeous. I have never used one before but really want to reinforce vocabulary next year. Thanks for the suggestions. I have limited kid-level space in my room. I did letters and ribbons with my words this past year and my word wall was elevated. The kids didn't use it that often, though. I'm not sure if it was because it was elevated or the words were too small or a combination. How high up is your word wall and how big do you make your words?